Crepe filling needn't be complicated. Here are some ideas for your next Chandeleur celebration or whenever you feel like enjoying a stack of French style pancakes. 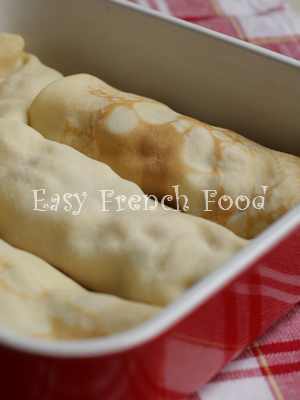 Try one of the many spreads that are popular here in France along with this basic crepe recipe for a quick sweet crepe. These make a great offering at a kid party - everyone enjoys spreading on their favorite topping. 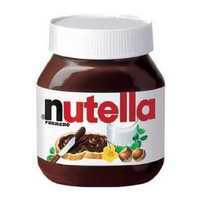 Nutella - I think even in the US now, you are all familiar with this chocolate hazelnut spread. There's always a jar of Nutella in my pantry, so I'm ready for the next mid-afternoon crepe eating frenzy. Speculoos - Maybe you've heard of this super sweet and crispy French cookie. Now it comes in a spread: speculoos à tartiner. A vrai horreur if you ask me, but I know some of you are going to love it! Maple Syrup - The French love sirop d'érable imported from their Canadian counterparts - les Québécois. This could be a pretty messy crepe filling, so maybe you'll want to eat it with a fork. Dairy Spreads - Crème fraîche, whipped cream and mascarpone cheese all lend themselves to crepe eating. Sprinkle with your favorite sugar. Peanut Butter - It's a slow uphill climb for the ground nut spread here in the Hexagon. It's the kind of food everyone seems to either hate or love. Should spread pretty easily on those crepes though. Crème de marrons - Sweetened chestnut puree is just the ticket for a more sophisticated palate. It is flavored with a hint of vanilla. Honey - But not just any honey. How about rose-hip, chestnut, or French lavender honey to chase away those winter blues? Crepe dinner parties are popular here in France. One can even buy an electric crepe machine that cooks several crepes at a time, so guests can get in on the action. However, just as likely, the host or hostess makes the crepes themselves ahead of time, then offers a variety of fixings to their guests who can assemble a meal to their liking. Here are some ingredients that are popular in France - mix and match as you wish. Many times a quick heating in the oven will be needed to melt cheese and bring out flavors. Cheese: For a French effect try Emmental, Camembert, Comté, Reblochon, or Roquefort cheese. Meats: Ham, chopped cooked bacon, cubed cooked chicken breast. Cooked slices of potato, onion and/or mushrooms. Crème fraîche - this is one of those ingredients that can go either sweet or savory depending on what you add to it.